Rapper T.I. looks on during a game between the Miami Heat and the Atlanta Hawks at Philips Arena in October 2010. 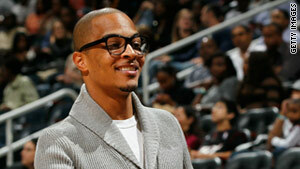 On Thursday, his attorney says officials have moved him to a "different facility"
(CNN) -- Rapper T.I. has been removed from a halfway house to a "different facility" a day after he was furloughed, apparently because of prison officials' objection over his using a tour bus to move between facilities in Arkansas and Georgia, his attorney said. T.I. was being held in the U.S Penitentiary in Atlanta on Friday morning, according to the Bureau of Prison's online inmate locator. The rapper had walked out of a federal prison in Arkansas on Wednesday morning, 10 months after he began serving a sentence for violating his parole on a gun conviction. He had been expected to complete the last weeks of his 11-month sentence in a community service center, or halfway house, in Atlanta. Steve Sadow, T.I. 's attorney, said the issue that prompted his client's latest move related to how the rapper got from the Federal Correctional Center in Forrest City, Arkansas, to Atlanta. T.I., whose real name is Clifford Harris, had agreed to provide his own transportation between the two locales, but federal prison officials are reviewing how he got there -- in a tour bus -- according to Sadow. A U.S. Bureau of Prisons spokeswoman told CNN Thursday night she was not immediately able to disclose where he was transfered. The bureau's online inmate locator listed Harris as being "in transit" Thursday evening. The rapper was joyous in Twitter postings immediately after he walked from the prison Wednesday morning. "The storm is over & da sun back out. IT'S OUR TIME TO SHINE SHAWTY!!!!! Welcome to the beginning of our Happy Ending!!!!" he tweeted. He also immediately began taping a new reality TV show as he boarded his bus, a series that cable channel VH-1 announced just hours after his release. The as yet-untitled 10-episode series, which will premiere in December, will show T.I. "as he re-adjusts to life as a free man after being incarcerated for nearly a year in a federal prison in Arkansas." VH-1 said. "Viewers will get a behind-the-scenes look at the most private and personal moments of one of today's hottest, most sought after Grammy winning artists as he is reunited with his wife and kids and thrust back into society at this crucial juncture in his life," the channel said. This was the rapper's second stint in the Arkansas prison. He served seven months there in 2009 as part of an unusual sentence negotiated two years ago to resolve federal gun charges. Those charges followed his attempt to buy three machine guns in the parking lot of an Atlanta grocery store. His latest stint behind bars was triggered by his arrest, along with that of his wife, after a motorcycle officer stopped their car on Sunset Boulevard in Beverly Hills, California, a year ago. A police report said suspected drugs were found in the couple's car and they were both arrested on drug charges. While the charge against the rapper was later dropped, he failed a drug test given by his parole officer. CNN's Greg Botelho contributed to this report.